Your air conditioning coolant may very well be one of the most vital parts of your AC system. What does the coolant actually do? A coolant is a chemical that can change from liquid to gas and back with out much pressure. Through this it gathers and releases heat creating a cold surface for your AC fans to blow over. This is why it’s so important to keep the correct amount of coolant inside of the system at all times. Do I need to recharge my air conditioning coolant? Blowing room temperature air — Is your unit blowing air that could best be described as meh? It’s pretty disappointing when you turn your AC on for that first real scorcher and all that happens is room temperature air blows out. This is typically caused by a lack of coolant in the system. Luckily this is an easy fix for a trained professional. 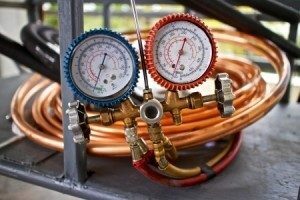 Frozen Coils — The coils or pipes that carry the coolant around and facilitate the change from hot to cold are pretty durable, but every once in a while they’ll spring a leak. Air conditioning coolant is made so it can get very cold, meaning when it does escape it’ll pretty much freeze all the surrounding area. If you notice a lot of ice buildup call your trusted experts at Sanders & Johnson Heating and Air Conditioning to come out to your home for a free estimate. In order to turn your house back into the igloo that you love, and make sure to keep your unit properly charged. Call us today at 303-422-6606. Here at Sanders & Johnson Heating and Air Conditioning or by filling out our Contact Us form. We can replace your air conditioning coolant in Denver, CO at an affordable rate!